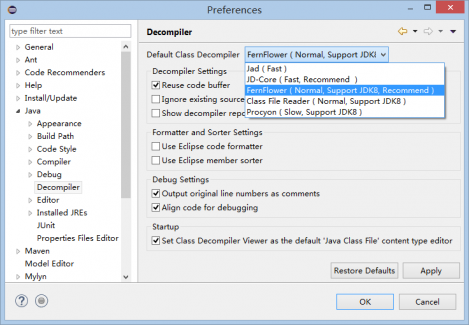 Enhanced Class Decompiler integrates JD, Jad, FernFlower, CFR, Procyon seamlessly with Eclipse and allows Java developers to debug class files without source code directly. It also integrates with the eclipse class editor, m2e plugin, supports Javadoc, reference search, library source attaching, byte code view and the syntax of JDK8 lambda expression. It is based on the popular (delisted) "Eclipse Class Decompiler" Plugin, but members of the open-source community enhanced it by removing all code which might compromise your privacy or security (i.e. everything discussed in https://0x10f8.wordpress.com/2017/08/07/reverse-engineering-an-eclipse-p... and everything else which seemed suspicious) to bring back the great core plugin functionality to all Eclipse users. (Code-)Reviews and pull requests welcome! 77 Cannot continue the operation. There is another install operation in progress. By adding the following code below to your website you will be able to add an install button for Enhanced Class Decompiler. Does this work with Call Hierarchy? This works great for opening and reading .class files! But is there any way to use Call Hierarchy on functions in .class files? When I try, it can never find anything. I have tried to install it manually by /dropins folder and many other ways without url. If somebody know what need to download for manually installation - pls comment here. Does this work on 2018-09 (4.9)? I tried all instructions and install/restart multiple times. It does not work. It used to work on neon. Ignore this. All I had to do was make sure there I configure default editor for .class files. Please try version 3.1.1, where this problem is fixed. I just read through the interesting blog about how this plugin came into picture and I am excited to use this plugin on my eclipse. But somehow it doesn't decompile. It was installed without a problem but it doesn't show up under Java in Preferences(as in Screenshot). Need help! Thanks in advance. Unable to read repository at ecd-plugin.github.io/update/content.xml. This tool really works. I manage to save an old project (written on java 8). Thanks! It read also lambda expressions without problem. By the way I use Oxygen.3a Release (4.7.3a). Class decompiler not working. Could anyone help on this. Works fine when opening a .class file from the project tree. But when I'm debugging an application and reach a file for which I don't have a source, the decompiler editor is not opened. Instead I see a "Source not found." editor with "Edit Source Lookup Path.." button. .class and .class without source are associated with the Class Decompiler Viewer as suggested in the documentation. Any setting that I missed. Enhanced Class Decompiler 3.0.0 with Eclipse Oxygen. Unable to read repository at url: ecd-plugin.github.io/update/content.xml. I cannot reach the repository either with the same error message. Navigating with a browser takes me to a 403 page. This is a misleading error message from eclipse and is usually triggered by a errornous network configuration - in fact, in can be any network problem. Did you check if you need a proxy configured in Eclipse? If the problem persist, navigate manually to https://ecd-plugin.github.io/update/ download the jar files and place them in the features and plugins folde rof your eclipse installation. Thank you for your feedback. Did you try to install ECD on a clean Eclipse, and are the ECD features listed in the About dialog? As stated on https://github.com/ecd-plugin/ecd/issues/17, the problem was fixed by removing any old EclipseCD leftovers and reinstalling the extension.